As our motto says … we are “always imitated – never duplicated”. 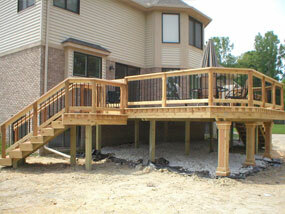 Kyle Builders, Inc. has set the standards in the deck, raised cement porch, and finished basement industry since 1979. Our customers often tell us that our competitors claim, “We can do whatever Kyle does”. Unlike our competitors, who seem to have different pictures of the same job (in hopes that you won’t notice), our portfolio proves what we claim. Please, take some time to enjoy our website and you will quickly realize why Kyle Builders, Inc. has been Michigan’s premier custom deck, cement porch, and finished basement contractor for over 30 years. Anyone can achieve simplicity and build cookie cutter projects. That we do not dispute, but we are not seeking that piece of the pie. We strive to be different. 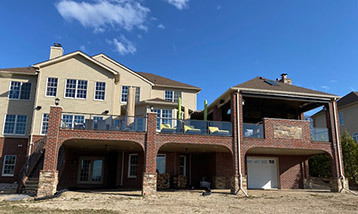 Therefore, we make every effort to achieve perfection, to fulfill your dreams, and to do “follow ups” like no other deck, cement porch, and finished basement builder in Michigan. Through the years, we have kept our ear to the ground by listening to the needs and wants of you, the consumers. What are you looking for and what are your concerns? We then take your ideas and carry them out to fulfill your wildest dreams. This is why we are the most sought after deck builder and finished basement contractor in Michigan (all the glory goes to God our Father who ultimately runs this company). Our professional team gives you, the customer, our undivided attention. Other deck builders and finished basement contractors seem to push their desires on you (which is usually based on their limitations). Our complete and exclusive attention begins right from the original call to Kyle’s brilliant designs, to the free bid package, to the final inspection, to the maintenance program, and beyond. Our integrity does not stop at the sale, as it seems to do with so many, but it continues right through to the finished product. We have created a service department to give our deck and basement customers (and our competitor’s customers) an avenue to address any concerns and/or maintenance upkeep for years to come. This is just one of the ways that we, at Kyle Builders, Inc., have been able to continually serve and satisfy our Michigan customers with their custom deck and basement needs for so long. Content & Images Copyright ©2019 Kyle Builders, Inc. All rights reserved.